1. Mind : برا منانا : (verb) be offended or bothered by; take offense with, be bothered by. I didn`t mind a bit. I don`t mind your behavior. Object - express or raise an objection or protest or criticism or express dissent. 2. Mind, Brain, Head, Nous, Psyche : ذہن - عقل : (noun) that which is responsible for one`s thoughts and feelings; the seat of the faculty of reason. Just keep this thing in your mind ok. He has his own mind what do we do? 3. Mind, Heed, Listen : توجہ دینا - دھیان دینا : (verb) pay close attention to; give heed to. Mind you! he is a huge hypocrite. Obey - be obedient to. 4. Mind : یاد : (noun) recall or remembrance. Recall, Recollection, Reminiscence - the process of remembering (especially the process of recovering information by mental effort). 5. Mind, Judgement, Judgment : رائے : (noun) an opinion formed by judging something. Conclusion, Decision, Determination - a position or opinion or judgment reached after consideration. 6. Mind, Take Care : نگرانی کرنا : (verb) be in charge of or deal with. Care, Deal, Handle, Manage - be in charge of, act on, or dispose of. 7. Mind, Creative Thinker, Thinker : دانشور : (noun) an important intellectual. The great minds of the 17th century. 8. Mind : توجہ : (noun) attention. Notice, Observance, Observation - the act of noticing or paying attention. 9. Mind, Beware : ہوشیار رہنا - خبردار رہنا : (verb) be on one`s guard; be cautious or wary about; be alert to. Look Out, Watch, Watch Out - be vigilant, be on the lookout or be careful. 10. Mind, Idea : سوچ : (noun) your intention; what you intend to do. He had in mind to see his old teacher. Aim, Design, Intent, Intention, Purpose - an anticipated outcome that is intended or that guides your planned actions. 11. Mind, Bear In Mind : ذہن میں رکھنا : (verb) keep in mind. Remember, Think Of - keep in mind for attention or consideration. 12. Mind, Intellect : ذہانت - دماغی استعداد : (noun) knowledge and intellectual ability. Offended, Pained : ناراض : hurt or upset on something. "Are you offended with me?" Mind Reader : اشراق کا ماہر : a magician who seems to discern the thoughts of another person (usually by clever signals from an accomplice). Minatory : منحوس : threatening or foreshadowing evil or tragic developments. How this page explains Mind ? It helps you understand the word Mind with comprehensive detail, no other web page in our knowledge can explain Mind better than this page. 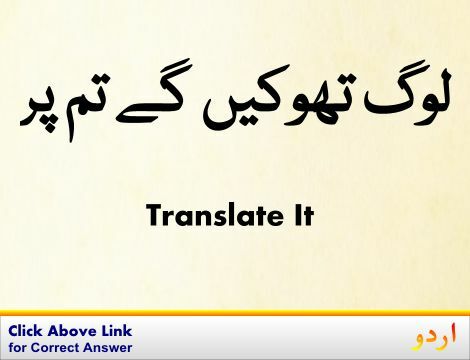 The page not only provides Urdu meaning of Mind but also gives extensive definition in English language. The definition of Mind is followed by practically usable example sentences which allow you to construct you own sentences based on it. You can also find multiple synonyms or similar words on the right of Mind. All of this may seem less if you are unable to learn exact pronunciation of Mind, so we have embedded mp3 recording of native Englishman, simply click on speaker icon and listen how English speaking people pronounce Mind. We hope this page has helped you understand Mind in detail, if you find any mistake on this page, please keep in mind that no human being can be perfect.